Cheers to new adventures! Spring is in full bloom in Raleigh, N.C., not only with beautiful outdoor landscapes but also with awesome, new experiences. We&apos;ve listed 32 new things for you to do here—places to eat, places to stay and more—that have recently opened or are coming this spring or early summer. From enjoying craft cocktails underground to listening to music under the stars, there&apos;s a lot to check out! Looking for some new nightlife options? Owner of the local-favorite Hibernian Restaurant & Pub and Raleigh Beer Garden (with world&apos;s largest selection of draft beer!) Niall Hanley just opened up Watts & Ward as downtown&apos;s newest underground bar. Watts & Ward serves up refreshing craft cocktails and bottled beer. This 6,000-square-foot, multi-room hideout is located in the basement of the historic Montague Building and offers a 1920s America atmosphere. Want to check out great views while sipping on a tasty beverage? Located at the new AC Hotel Raleigh North Hills, Level7 offers a European-inspired experience with N.C. spirit. This brand-new rooftop bar overlooks the North Hills area and is a great place to enjoy cocktails and tapas. The quaint town of Wendell certainly lives up to its motto, "Small Town, Big Charm." The newest addition to Wendell&apos;s downtown is Oaklee Distilling Co. Beginning on May 5, the distillery will be open for tours and tastings. Enjoy samples of their Boots Vodka, which is distilled from locally-grown sweet potatoes and corn. Boots Vodka is currently available throughout the area at ABC stores. Don&apos;t miss new additions to the area&apos;s food scene! Try Neapolitan pizza from Cary&apos;s Pizzeria Faulisi; small plates of Mediterranean fare paired with excellent wines at Vidrio; Latin-inspired street food at so•ca; and delicious drinks and hot dogs at The Cardinal. Check out all eight restaurants on our recent list: Eight New Restaurants You Have to Try in Raleigh, N.C.
Scandal, murder, ghost tales and Civil War history! The new Untold Tales Raleigh Walking Tour run by the Triangle Glides covers approximately two miles of easy walking in downtown Raleigh. An expert guide tells you the little-known, true tales of the historic capital city, including the gruesome fate of the namesake of the city, tales of the dreaded pillory, ghost tales and more! Catch a North Carolina Courage soccer game at WakeMed Soccer Park in Cary. The newest team of the National Women&apos;s Soccer League is bringing the heat! Check the schedule, here, for games all spring and summer. Dorothea Dix Park will be hosting its first music series this summer, Y&apos;All at Dix Park, presented by Deep South Entertainment. The Sat. concerts (the first one being June 24) each feature four to five local acts and food trucks on-site. Picnics are definitely encouraged. 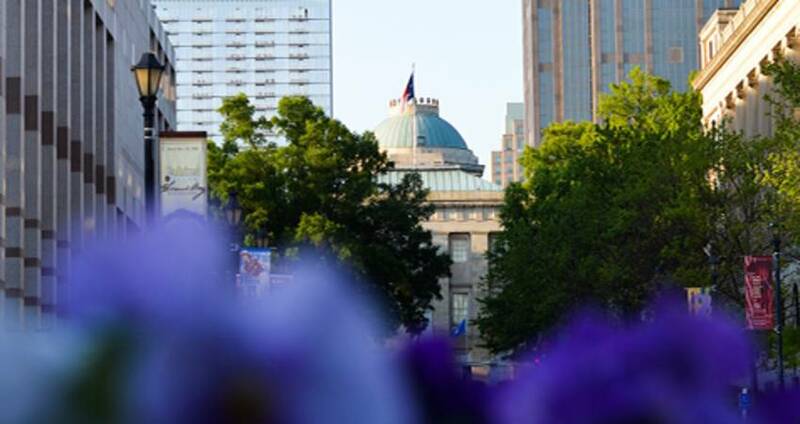 And get ready for some photo opps with a great view of the downtown Raleigh skyline from the park! Enjoy a pint of N.C. beer at one of the area&apos;s new breweries. Brewery Bhavana is a brewery, taproom, dim sum restaurant, library and flower shop all in one. Taste delicious beers in the heart of downtown Raleigh created by head brewer Patrick Woodson, all of which pair perfectly with dim sum options. Ultimately, it&apos;s a gathering space welcoming people from all walks of life, backgrounds and futures. Another new brewery to check out this spring is Brice&apos;s Brewing Company. The town of Garner&apos;s first brewery features a Belgian-heavy beer lineup. Sip on the Intermezzo Belgian Dubbel, featuring notes of dark caramel, orange and slight pepper. Jordan Lake Brewing Company in Cary nods to the N.C.-favorite Jordan Lake. The Sandy Beach Blonde Ale, a lightly hopped thirst quencher, is a great beer for the spring! FRESH. Local Ice Cream is now open in downtown Cary! This family-owned business makes homemade ice cream with ingredients from local farms. Order the banana pudding ice cream in a waffle cone for the perfect sweet treat! Or go for a classic! Also, plan to visit Two Roosters Ice Cream this June at their new brick-and-mortar location in Raleigh&apos;s Greystone Village shopping center. This popular food truck is currently scooping from a vintage camper and is excited to open their new location in time for the warm summer months. The North Carolina Museum of Art recently expanded its Ann and Jim Goodnight Museum Park and is featuring awesome, new art. New, long-term installations include artist Jaime Hayon&apos;s SCULPT. C, an interactive play structure, and Jaume Plensa&apos;s Awilda & Irma, two larger-than-life head sculptures. Check them out here! Walk around the 164-acre park to take in all the art and the natural beauty, and after exploring, enjoy a picnic lunch. You and your friends are trapped in a room with a zombie! Think you have what it takes to escape? Raleigh Room Escapes offers quite the adventure for groups. Inside each room are clues scattered throughout. Move, touch, pull, turn, twist and open as many things as you can to find clues, and hope you make it out before the buzzer! Their newest room escape is The Watering Hole—the first mobile room escape in N.C.—a mysterious trolley that transports you back to a pub in the land of Eire. Imurj is Raleigh&apos;s newest collaborative space for emerging visual artists, performing artists and fans in the Warehouse District. Catch a live performance by one of your favorite N.C. musicians, try local beers on tap and snack on local eats! Get your caffeine buzz on at Sir Walter Coffee, a community-based coffee barista bar, tea house and bottle shop. We&apos;re loving the fact that this new shop is the only spot in downtown Raleigh to serve bubble tea! Headed up by a family that wanted to create a place where visitors can get a taste of the community&apos;s charm and make a few friends in the process, Old Town Market Shops is a new family- and pet-friendly shopping experience in Wake Forest offering an open air flea market, farmers&apos; market and speciality shops with local crafters and artisans. Also, head to Sugar Magnolia Cafe in downtown Wake Forest to explore more than 35 artists and artisans while enjoying freshly-prepared dishes and drinks. Are you a history buff? Make plans to check out the new Little House Museum & Gallery in Rolesville. Learn about the four generations of the Terrell family who once lived at the house and plan to visit the adjacent gallery space, which thematically pairs antique arts and crafts with contemporary works by local artists. or the four-star Renaissance Raleigh North Hills Hotel with renovations expected to be completed this spring—the hotel will "usher the inside/out and work/play concept into one beautifully chic, highly functional, truly Raleigh experience..."